It is only 3 weeks today until our Annual Produce Show at Burton Green Village Hall on Sunday 8th September. Times for staging exhibits, judging and Open to Public were listed in the Schedule which was recently put through your door. Don’t forget to feed and water your pot plants and nurture your vegetables. Watch the size and pick slightly early if necessary. Read the schedule carefully for number of fruits and vegetables to display. This year has been a good year for vegetables and fruit so we are hoping for a very Competitive Show. Ladies and Gentlemen who bake, treat your family and practice your cake making skills and if you haven’t entered the Preserves section before, try your hand at making Lemon Curd or Jam, fruit is plentiful at the moment. We have had more children entering the last two years and this year have put in an extra section for children to handwrite a verse and illustrate, plus 4 different cooking skills and for those who like more of a challenge there is an art, garden and modelling section. If you prefer not to enter, just come along and enjoy the Show and enjoy a sit down with a pot of tea or coffee and a slice of homemade cake. Entry to view the show is free. There is a small charge to enter exhibits for Adults. Childrens entries are free. Should you require a schedule or have any queries please contact me 024 7646 2070. Whether you are a walker or cyclists, you will be interested in this event. Sustrans are organising a walking/cycling event, commencing from Victoria Park in London on 16 August and working its way through the United Kingdom, stopping at the Greenway in Kenilworth on 29 August 2013. Preregistration is available by clicking Pedal On UK, or emailing pedalonuk@sustrans.org.uk, or at 2pm on 29 August at the Abbey Fields for the walk/ride to Pavillion Fields. It should be great fun and is putting our area on the map. Hope you can all make it and look forward to seeing you then. Please join us to celebrate the Kenilworth leg of the St Neots to Birmingham stage of Pedal On UK Join us for afternoon tea and to welcome in the riders. Pedal On UK is celebrating 84 new walking and cycling networks completed by Sustrans, extending the National Cycle Network deep into communities around the UK, helping people of all ages and all abilities to get about on foot or by bike. At the heart of Pedal On UK is a bike ride of Sustrans volunteers and Games Makers. Delivered by Sustrans and backed by the Big Lottery Fund’s Keeping the Spirit of 2012 Alive campaign, the Pedal On UK riders will carry the legacy of the Olympic and Paralympic Games to 37 communities by cycling along National Cycle Network routes between London and Glasgow over 23 days. Pedal On UK will also feature a series of community events along the route where people can take part in fun activities and learn more about the benefits of travelling by bike or foot. 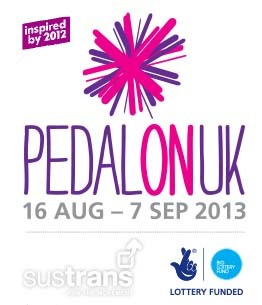 Please RSVP to pedalonuk@sustrans.org.uk We look forward to seeing you there!